As featured in www.popularmechanics.com and www.instructables.com ! A step by step guide to help your create your own backyard Tiki Bar. 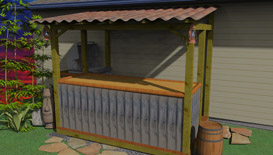 the Google Sketchup model of the bar, which can be opened in the free download of Sketchup! After a few minutes of using this program you'll be able to zoom in and out on any detail you like, and even take a tape measure to different areas for an even greater understanding of the build process! The folder comes as a .zip. You will need WinZip or similar program to open it. As with all my creations, I am here to answer any and all of your questions, anytime! Just wanted to drop you a note to let you know the plans are SPOT ON! Just finished up with my tiki bar.. I have received nothing but rave reviews so far. I was able to do 99.9% of it by myself. Even a novice can make a truly professional looking bar.